Here's' sort of a weird part of my psyche I've never really addressed for ya. There is a part of me, that, no matter how much I might now be into weird old school blues, or ABBA or whatever else tickles my fancy (These days mostly Sun Ra) there will always be a place in my heart for underground death metal. 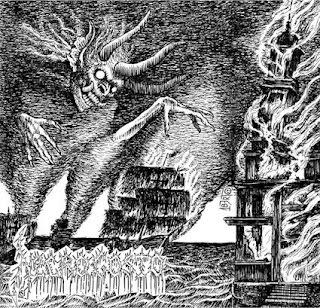 Specifically, the unholy breed of underground death metal pushed by labels like Nuclear War Now, whose latest offering, the Necrogosto demo speaks perfectly to the burning power of old school extreme metal madness. Necrogosto are doing something really cool here, hearkening back to the old school Minas Gerais grindcore scene. The band understand the drive of their compatriots in bands like Sarcofago, Sexthrash and Necrofago. The South American death metal mayhem is strong here, but the band pushes so far beyond that frequently. While there is a clear love for the dungeon dwelling madness of the genre, Necrogosto also seem to gt a kick out of touches of Celtic Frost worship and punishing Florida death metal ideas. The band craft terrifying sonic landscapes here and their tape hiss fueled sound becomes ever more addictive. There is a sort of brutal sub-equatorial fury here that boils throughout the record. There is something almost horrifying about the dark unreality painted before you and the way that the monochromatic album art speaks so perfectly to what Necrogosto are about. This is extreme metal for those of us who go to sleep in a bed of entrails ,who slaver over the weak and are ready to drink the blood of the innocent. It's fucked up and magical and I love it, because this is why I got into extreme music in the first place.